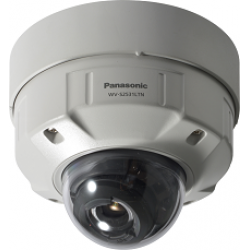 panasonic Fixed Dome Network Camera is based on the concept of "i-PRO EXTREME". Panasonic has developed a vast selection of IP security systems and products, which combine cutting-edge technology with versatile recording and monitoring functionality, all designed to be compatible with ONVIF (the Open Network Video Interface Forum global standards). Our portfolio of network static security cameras comprises a number of innovative features. From pan-tilt wireless network cameras featuring body heat sensors, to Auto Back Focus for achieving stable focus and Super Dynamic technology for attaining a wider dynamic range, our network static cameras are designed to provide a solution for every security or surveillance need. Simultaneous real-time, high-resolution recording, compact or vandal resistant housing, face detection and smart phone monitoring are just some of the features that can be found within our range. Other features include progressive scanning for delivering clear images with reduced motion blur and Digital Noise Reduction (3D-DNR) for providing clarity even in the noisiest of environments. WV-S3532LMiA (intelligent Auto) H.265 Compact Dome Camera• Full HD 1080p 60fps• iA (intelligent Auto..
WV-S3531LiA (intelligent Auto) H.265 Compact Dome Camera• Full HD 1080p 60fps• iA (intelligent Auto)..
WV-S3512LM iA (intelligent Auto) H.265 Compact Dome Camera• HD 720p 60 fps• iA (intelligent Auto)• S..
WV-S3511L iA (intelligent Auto) H.265 Compact Dome Camera• HD 720p 60 fps• iA (intelligent Auto)• Su..
WV-S3131L iA (intelligent Auto) H.265 Compact Dome Camera• Full HD 1080p 60fps• iA (intelligent Auto..
WV-S3111L iA (intelligent Auto) H.265 Compact Dome Camera• HD 720p 60 fps• iA (intelligent Auto)• Su..
WV-S2550L5-megapixel Vandal Resistant Dome Network Camera• 5-megapixel images up to 30 fps• iA (inte..
WV-S2250L5-megapixel Dome Network Camera• 5-megapixel images up to 30 fps• iA (intelligent Auto)• Su..
WV-S2531LNSuper Dynamic Full HD Vandal Resistant & Weatherproof Dome Network CameraFull HD / 1,9..
WV-S2511LNSuper Dynamic HD Vandal Resistant & Weatherproof Dome Network CameraHD / 1,280 x 720 6..
WV-S2211LSuper Dynamic HD Vandal Resistant Dome Network CameraHD / 1,280 x 720 60 fps H.265 Vandal R..
WV-S2131LSuper Dynamic Full HD Dome Network CameraFull HD / 1,920 x 1,080 60 fps H.265 Network Camer..
WV-S2131Super Dynamic Full HD Dome Network CameraFull HD / 1,920 x 1,080 60 fps H.265 Network Camera..